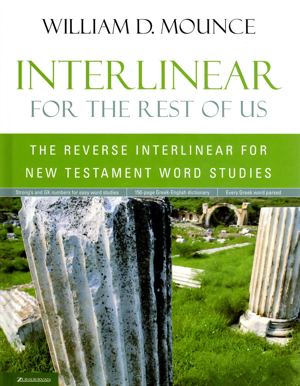 You can purchase the Interlinear for the Rest of Us online from ChristianBook.com or from your local bookstore. Download the Preface and Philippians. You can also download the Guidelines to the tagging nomenclature. This book makes the Greek New Testament and word studies based on it easily accessible to everyone, all in one volume. Most interlinear Bibles are superb resources for Greek students. But what about the rest of us who don’t know Greek? Here is the answer. While other interlinear Bibles assume that you know Greek. Interlinear for the Rest of Us assumes that you don’t, or that you’ve forgotten much of what you once knew. Designed for busy pastors, Sunday school teachers, and anyone who wants a practical tool for studying the Scriptures, this interlinear makes reading easy by flip-flopping the usual order of appearance. It uses the English text as the main text rather than the Greek, so there is absolutely no confusion about the meaning of what you’re reading. Discover the Greek words behind the English translation. Conduct your own word studies using Greek word study books—without knowing Greek. Bill Mounce created the term to describe his innovation. Other interlinears follow Greek word order, which makes the English translation nonsense most of the time. And if a person is using an interlinear, they probably don't know enough Greek to make use of the Greek word order. So why not switch them? The Reverse Interlinear keeps English word order and switches the Greek to match. This means you can make sense of the English, and look beneath each English word to see the Greek behind it, its parsing, and its GK number, which can in turn be used for Greek word studies.